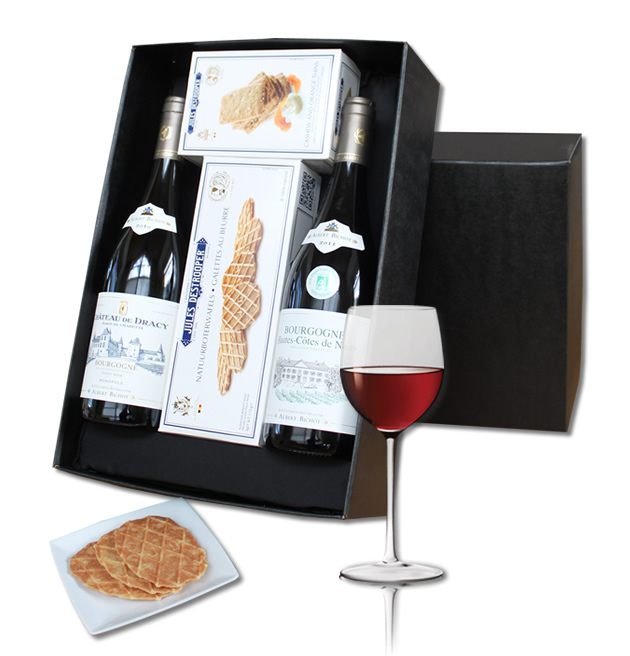 A luxury stylish black box with satin inlay, filled with 2 bottles (75cl) of Bourgogne wine (75cl), Hautes-C�tes de Nuits en Ch�teau de Dracy, and a collection of gourmet Jules Destroopere cookies. A wishcard with your own personal message makes everything complete. We deliver this gift in the Benelux, France, Germany, Austria, Denmark, Hungary, Italy, Slovakia, Denmark, United Kingdom, Czech republic, Poland. Order today before 3pm. for delivery any day of your choice.